Bitcoin and virtually all other cryptos remain in a murderous decline today, with coinmarketcap.com showing that only three are in the green over the past 24 hours (yesterday there were just two). I realized it is a good day to reiterate something I tell interested parties often, especially at times like these: for every dollar you put toward investments, put two toward your debts. Why do that? I'll explain (strap in, this is a long one). I've been using a budgeting strategy for nearly two decades now that was inspired by the book, The Richest Man in Babylon by G.S. Clason. I've been using it all of these years because, frankly, it works. I blogged about it here years ago, too, though upon review of that post this morning I discovered that the flow chart I had created to illustrate how it all works became lost forever on an image hosting site I once used. No matter, it's easy enough to recreate (and retain a copy of on my hard drive, this time...). The budget prescription given in the book breaks one's income down three ways by percentages. Wages and "windfalls" (tips, money you find on the ground, prizes, etc.) are all part of your income, and for most people will start out as their sole source. 70% of this goes to your living expenses, 20% to your debts, and 10% into investments. Clason's original work recommended a strict adherence to these categories; basically, once funds entered one of the three categories, they and all funds subsequently generated by them stayed in that category. Living was strictly that, the maintenance of one's day-to-day life. Debt repayments were strictly confined to that category, and the income generated by investments was to be retained and compounded. 3) Combining points 1 and 2, the amount that debts cost an individual in terms of their minimum obligation have a huge impact on the sum total of their required income, such that eliminating the debts and their corresponding required minimum payments will typically propel someone toward financial independence (no longer needing to work for money) faster than investment growth usually will, so this ought to have a greater priority. 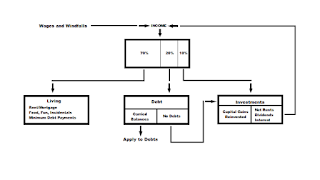 Therefore, as you can see by my flowchart, I have my budget set up in this way, with my passive income redirected back to the "top" of the chart so that it may filter down through the three categories (as such, there is some compounding of my passive income, but it's not prioritized). This both makes life more comfortable now, and it moves me closer to not having any debts faster while still building assets. 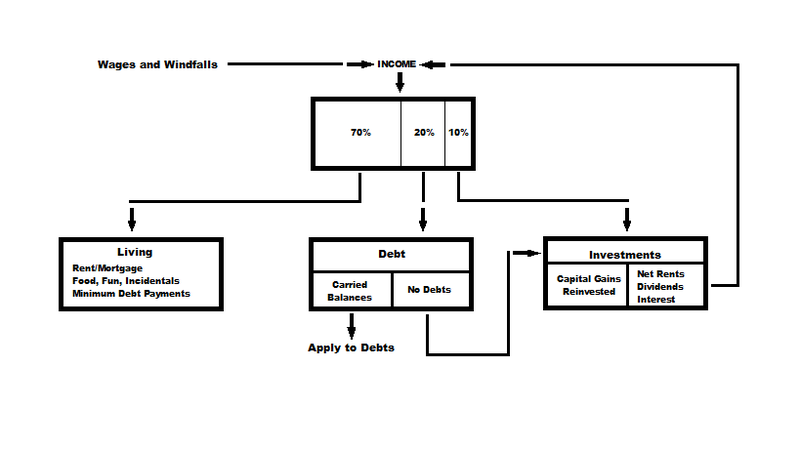 That leaves just two other tweaks to the system, one of which was actually suggest by Clason: if you have no debts, the 20% allocated to them could be broken up between the living and investment category as you see fit. When I get that far, I plan to just dedicate all of it to investments; since I'm feeding the income they produce back into the budget anyway, I figure that doing so will grow the living category with the resulting additional passive income plenty enough to keep me happy, so why not? The other tweak is that when I do have a capital gain from my investments, I reinvest the full net amount of it, typically into something offering a higher yield than what the gain resulted from (one exception to this are those rare occasions where cashing something out and eliminating a debt with the proceeds could yield greater over-all cash flow, which was the case when I sold some REIT shares this past spring and then nuked my student loans in one go). I have my investments spread out over lots of different asset classes, markets, and industries, far too many to list here without it becoming a blog post of its own. Among all of the options out there, I think dividend stocks are the easiest to access. Costs in the form of commissions can greatly hamper initial efforts and the resulting yields, which is why I recommend using Robinhood for this. Robinhood offers commission free purchasing and the interface is a smart phone app. Not having to pay investing commissions is huge, because it makes small purchases reasonable to do and profitable (you can literally buy just one share of something and not have your future capital gains and yields killed by commission expense), and it puts this avenue for generating passive income within easy reach of anyone. This has become a long one. So to sum up then, this is what I have been doing for nearly twenty years now, and it works. My liabilities are shrinking, my assets are growing (and my net worth is positive, something that's unfortunately becoming increasingly rare these days), my passive income is also growing, and most importantly, the amount of money I need to earn from working is rapidly approaching zero.